Undated. Date from publisher's form of name and years of activity at address, cf. P.A.H. Brown. London publishers and printers, p. 55. First sentence: "It was the morning of a New Year, that had just set in, golden and beautiful." Copy in McGill Library's Rare Books and Special Collections, Sheila R. Bourke Collection: 1 of 48 books plus 5 duplicates. Black and white cuts used for more than one title. Pictorial buff wrappers. Duplicates from I. Mackenzie - $2.00. each; the remainder from Laurie Hill Ltd. - $10.00 the lot. Copy in McGill Library's Rare Books and Special Collections, Children's Collection: 1 of 48 books in the series. Black & white cuts used for more than one title. Pictorial buff wrappers. text.chapbook.black and white, 12 x 8 cm. 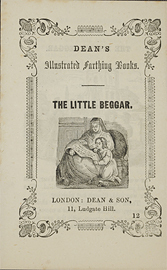 Poor children -- Juvenile fiction.